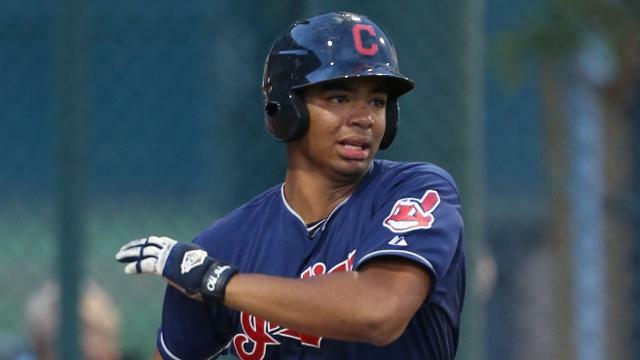 The Indians admittedly rolled the dice when they selected Bobby Bradley in the third round back in June. Not because the 18-year-old first baseman was a stretch for the 97th overall pick, but rather because he had publicly stated that he would head to LSU if he wasn't taken in the first two rounds. To entice him to make the jump to the pros, the Tribe offered the promising left-handed slugger an above-slot $912,500 signing bonus. The two sides agreed to a deal in mid-June, prompting Bradley to say, "I don't think I'm going to see campus." A little more than two months later, both the Indians and Bradley are already reaping rewards. Bradley was named the Rookie-level Arizona League's Most Valuable Player and is the circuit's choice at first base on the All-Star Team, as announced at the end of the AZL regular season. The Indians' No. 20 prospect was an easy pick for the league's top honor after putting himself atop the leaderboard in most of the major offensive categories. He ranked first in all three slash-line stats (.361/.426/.652) as well as homers (eight), RBIs (50) and total bases (101). He also added three triples, 13 doubles and three stolen bases in 39 games during his debut season. Bradley's inclusion at first base pushed Fran Whitten, another slugger who almost didn't go pro this year, to the DH spot on the All-Star squad. As told here, the 23-year-old first baseman was set for a career as a game warden before an impressive season at Florida's Saint Leo University propelled him to become a 37th-round pick of the Angels in June. Whitten owned a .343/.425/.519 line with two homers and 19 RBIs in 28 games with the Halos' Arizona League affiliate before moving up to Rookie-level Orem. D-backs right-hander Yefrey Ramirez was named the league's top right-handed starter after going 4-2 with a 1.93 ERA, 0.80 WHIP, 48 strikeouts and only four walks in seven appearances (37 1/3 innings). Thomas Pannone, also of the Indians, represented the southpaws on the All-Star squad, thanks to his 62 strikeouts which ranked third among all AZL hurlers. He also posted a 3.20 ERA and 1.24 WHIP in 11 outings (45 innings).